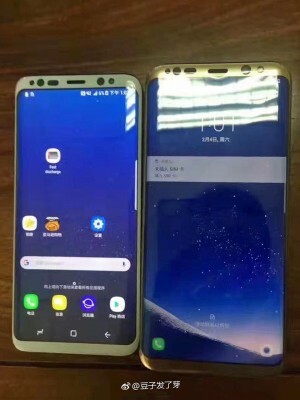 A new leaked photo shows the S8 duo chilling together - the Samsung Galaxy S8 and Galaxy S8+ side by side. You can see the difference in size and they appear different colors too. The top bezel is both thin and very busy - just look at all those sensors. Part of that is likely the facial recognition hardware next to the usual selfie cam, earpiece and sensors. In contrast, the bottom bezel is perfectly clean, the traditional hardware buttons replaced by virtual ones. 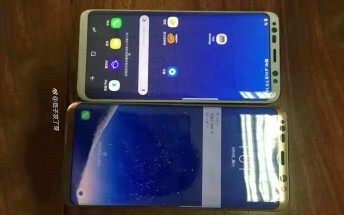 The on-screen buttons have an unusual design and will reportedly be customizeable. The fingerprint also had to find a new home, it now lives on the back.